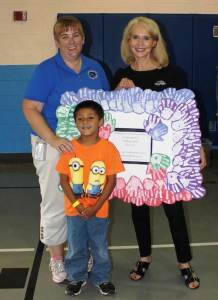 On Monday, September 8th, Centennial Elementary hosted its annual Open House & Carnival for students and their families, and several team members from McDivitt volunteered to run one of the games. 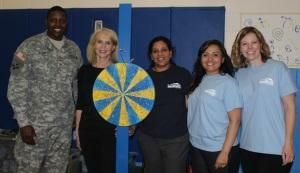 Karen McDivitt, Silvia Orozco, Kelly Davidson and Shanu Goyal were on hand to oversee the Wheel of Fortune – asking participants to “Spin to Win.” Several military service men and women from Fort Carson also volunteered, and the McDivitt booth was fortunate to have Sargent Eddie Ellis’ assistance during the event. Those who spun and won at the McDivitt booth had their choice of prize between a slinky or a hacky sack. The slinky became the clear favorite among the students. The carnival stayed busy for the entire two-hour celebration, while students and parents stopped by booths for food, balloon animals, face painting, and a plethora of games, including Plinko, Skee Ball, Bean Bag Toss, and the Duck Race.